The Immune Deficiency Foundation Guide for Nurses Immunoglobulin Therapy for Primary Immunodeficiency Diseases – Fourth Edition is now available. 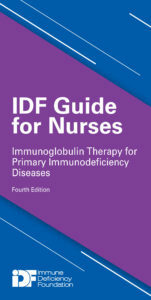 Developed by the Immune Deficiency Foundation (IDF) Nurse Advisory Committee, the guide includes general information about primary immunodeficiency diseases (PI), delivery of immunoglobulin (Ig) replacement therapy, product selection and characteristics, troubleshooting intravenous and subcutaneous Ig therapy, and more. This new edition includes changes in dosing and delivery as well as additional instructions for teaching patients. The sleek design and pocket size make it easy to use for busy nurses. This popular guide provides direction for nurses to administer Ig replacement therapy in the safest and most effective way. This is a must-have resource for all nurses who care for patients with PI. Download the guide from the IDF website: http://bit.ly/IDFGuideforNurses4th. This publication has been made possible through a generous grant from CSL Behring. 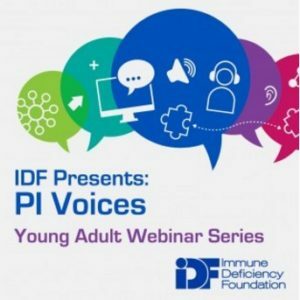 The Immune Deficiency Foundation (IDF) Young Adult Webinar Series was created to meet the needs and interests of young adults (ages 18-30) living with primary immunodeficiency diseases (PI). The years of your life when you’re determining who you are and who you want to be can be challenging, which is why having a community to support, guide and answer questions can be crucial to growth and success. In 2016 five live webinars were held. Presenters and participants alike asked and answered questions, discussed concerns, shared stories, and connected with people who are living with the unique challenges that young adults with PI face. To learn more about this program or to listen to webinar recordings, go to: www.primaryimmune.org/young-adult/webinars.